PALU - Continues to provide support for the recovery after the earthquake and tsunami in Palu and surrounding areas, the ESDM Ministry's Emergency Response Team (ERT) Team, today Wednesday (3/10) carried out several activities with the help of heavy equipment excavators and bulldozers. 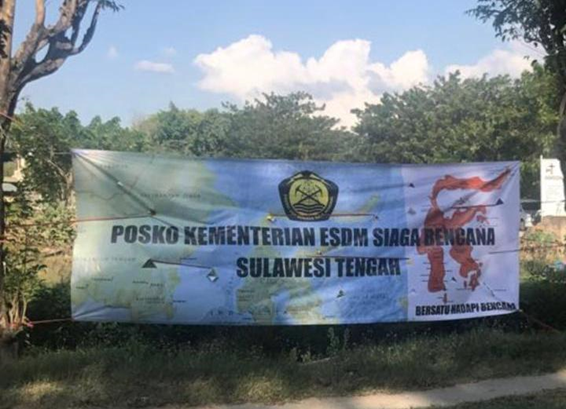 Chairman of the ESDM Rapid Response Team Satry Nugraha reported from the Disaster Preparedness Ministry's Command Post in Palu, some of the things that have been done by the joint company team in the ESDM sector today include logging trees to open access to 3 victims evacuation on Jl. Diponegoro, moving local goods that are still suitable for use, also mobilized bulldozer equipment from Poboya where PT Citra Palu Minerals was located at the MEMR Post. He added, the rapid work carried out by the ERT team included building a Public Kitchen in the Disaster Preparedness Ministry MEMR Command Post. "Today the team managed to evacuate 2 bodies on Jl. Cumi-Cumi, evacuate 1 victim on Kartini Street, evacuate 4 victims on Jl Sungai Bongka, to search for victims on Dewi Sartika III Street, Jono Oge Village, Sigi Subdistrict along the lane mud and found the bodies of 5 victims, "explained Satry. The team then sent all the bodies that were successfully evacuated to be taken to Bhayangkara Hospital. The ERT medical team of the Ministry of Energy and Mineral Resources also helped with medical treatment at Undata Hospital, Palu and conducted surgical operations at Undata Hospital. Satry said, the heavy equipment that the ERG team brought in alternately with the Basarnas opening access to the ruins (10.30 - 16.37 WITA) managed to penetrate the concrete at the Mercure Hotel. "Thank God the concrete at the Mercure Hotel was successfully penetrated this afternoon," he said.